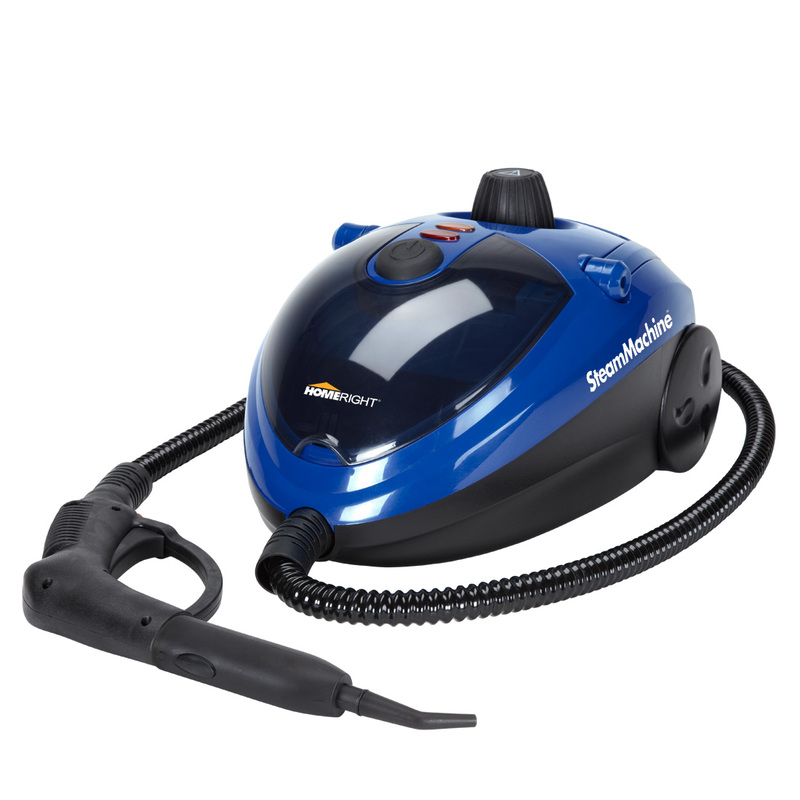 HomeRight has a product called the SteamMachine that makes light work of some pretty grimy jobs. We took our machine out this week and it made housecleaning safer because it uses only water (no chemicals), more thorough (those attachments let you get anywhere), and more fun (who doesn't like running around the house playing with a new toy?). 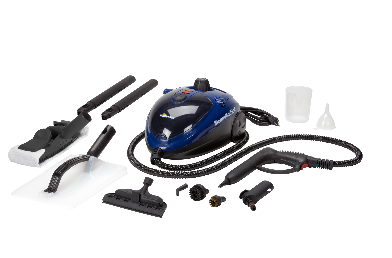 The SteamMachine is very lightweight and has a big, sturdy fold-down handle (love the handle!) that allows you to easily move it from room to room. It also has smooth-rolling wheels, so if you're using the attachment for cleaning the floor, it will move right along with you. It comes with a good number of attachments including a brass brush (for things like the oven), and a squeegee (for things like the shower, counter tops, or windows), and a jet nozzle. It also has a nice, flat attachment that allows you to easily loosen up the wallpaper and peel it off (no more fighting to get old wallpaper off of your walls!). The SteamMachine is easy to use, simply fill the cup up with distilled water (the cup and a funnel are provided), screw on the cap (do not unscrew it until the machine is completely cooled off), and turn on the switch. It takes about 8 minutes to get the steam built up. A ready indicator light will let you know when it's good to go. If the steam starts to diminish while you're working, you simply turn the switch on the nozzle to 'off' for about 40 seconds and it rebuilds the pressure just that fast. We used it on several areas. Once with the nylon brush attachment to remove crayon from the ceiling of my son's room (don't ask). The long attachment made it easy to reach the crayon on the ceiling. You can see it's coming off with no problem at all. On the ceiling in the Master Bath to remove those ugly spots that form if you don't run the fan all of the time after a shower. I guess the color variation is from turning on the light. IThe one on the left is before. The one on the right is after. Another time to make the chrome around the shower doors look shiny and clean. around the shower doors was impressively shiny. 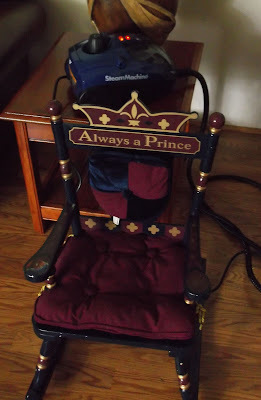 And my favorite way, to remove a Spiderman sticker that Prince Charming put on his rocking chair over a year ago that we could not previously remove. That's the steam cleaner in the back so you can see how portable it is...super easy to carry around. You can also see the indicator lights. Ugly sticker we could not remove. Ugly sticker is gooooooooooone. Woo hoo! There is a safety switch on the trigger so your children aren't going to get burnt if they happen by while you've stepped away for a second or two. I love that feature because you know kids are going to be intrigued with any new item that is being used by mom. Another feature I love is that the small attachments are stored inside the machine so you know you're not going to lose them. Woooot! I wish everything with attachments did the same. You can also follow them on Facebook, Twitter, Pinterest, and/or YouTube. The SteamMachine retails for $99.99, and you can enter to win one here. Wow! I have been looking everywhere I live for a good steam machine. I have a brand new tile shower that I need to steam clean instead of using a bunch of harsh chemicals. In the new house we moved into, i'd love to have it looking brand new! I would definitely use it in the bathroom and the kid's rooms. :-) Thank you. I would definitely use that in the master bathroom! Being a clean freak, that is the one room in the house that really makes me grit my teeth to clean. I think the people who lived here before us NEVER cleaned it, now the grime is stuck on and impossible to remove! And I am cracking up about that crayon on the ceiling! Kids have the funniest way of trashing our homes, don't they? My kitchen and bathroom walls and floors (and maybe even ceiling!) could really use this -- thanks! 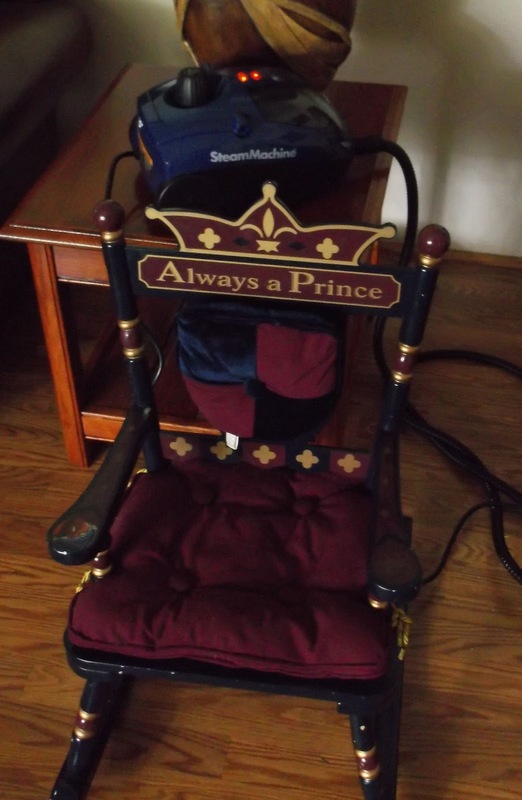 I would use the steam machine on my favorite upholstered chair! I would use this for my family room. In my living room and hallway. The living room, my dog loves to pee on the carpet! What a great review nd awesome giveaway!! I love to give it a go on my teenagers carpet! I would steam clean my couch. That could really come in handy no matter the place and thanks too for adding to the race. I love my Homeright Steam machine!! in the bathroom and kitchen and laundry room-and probably for cleaning out wastebaskets, garbage cans, even the birdbath. I would use it to clean my shower, there is very little ventilation and mold is rampant. I would like to use it on my showers. I would try it on the bathroom first! in the kitchen and bath for steaming off gunk I can't get off with my hands by scrubbing lol. We need to get lots of crayon off of walls, stickers off of random places, mildew issues, etc. Wow! I could go on and on. would certainly use it in the bathroom first! I would use it on the deck to clean the wood, on the patio doors, clean the BBQ grills, so much possibilities! I could use this for cleaning walls from the children's messes. My oven and stove really needs it bad! OMG I really need this we have pen on the counter, pen on the wall thanks to my son and our shower could use a good cleaning! would love to use it on grout! wow.. this is pretty neat. Oh I have kids and dogs. I think I would be able to find many places to use this machine. I would love to try it in the bathroom and kitchen for a cleaner clean too. I would it on the walls in the kids playroom. So many drawing marks on the walls. I would use this on the carpet to see if I could get some of the stains out from the previous owner's cats...UGH!!! I would use this on the carpet, sofa, bathroom!! I'd use this on the couch, it could use it...badly! I would use it in the living and family rooms. I'd use it in the bathroom around the shower, toilet and fixtures. I would love to be able to try this in my kitchen. in my bathroom, this is perfect. I could use this to clean my kitchen and bathroom floors, especially the corners. I need to steam the corners and base of my shower area. Well I have 5 kids so TONS!! I would start with the washrooms around the toilets and then tackle the kitchen behind the stove and fridge and then the walls and then the area around the litter box!! Hello, oh my son's shower needs this badly. Thanks for a great giveaway! The hallway could use this machine. I would use to clean my bathroom. For starters - In the bathroom and in the utility closet !! The carpet in the bedroom definitely could use it. I'd love this for the bathroom and to clean my couch!! I would use this in every room of our home! Kitchen tile floor chemical free, yes, please! In the front door area where everyone comes in.Thanks for the chance. I would first use it in the kitchen and work my way throughout the remainder of the house. Also on the outside of the house, especially the windows. I would use it on the tile in my bathrooms! I could use this machine everywhere. I just closed on a new home on Friday, the new place needs this in every room. I could use this to take off all the stickers my daughter puts everywhere. Man she's quick! The kids bedrooms for sure!! I would use it on the floors! This would be great for the kitchen. This will be great to use on the windows. It will be really helpful for us to use on our windows. I would love to use it in our bathrooms. The bathroom! Especially in hard to reach places (like all places are in our bathrooms!) and in impossible places like between shower tiles. I have a bunch of "art work" from my son on the walls upstairs that need to be removed. I would also see if it would work on scuff marks on the front door. I'd use it on pet cages and in the bathrooms. I'd use it to steam my kitchen floor and dirty areas in my camper. Thanks. I'd use this in my kitchen. Curious to see if the cooking stain by my stove would come out! I have a lot of tile in my home and this would be great for cleaning grout. My whole kitchen floor, would make things much easier! In my living room and the kids room. I could use the the steam machine in my kitchen, on the cooktop, in the microwave, around faucets and more. My kitchen, the bathrooms, outside furniture! I would use it everywhere in my bathroom. It really needs a redo but we don't have the money for that yet. This would be wonderful to have until then. we could use his in the kitchen on the grout or on the stckers we have stuck in crazy places. The bathrooms! We're actually becoming foster parents and we don't want to use harsh chemicals. This would be fantastic! I would use the steam machine in the cat's corner of the house where there is always a mess. I would use it everywhere, with two teens and their friends, my home always feels a bit messy! I would use it in the kitchen and bathrooms. My bathroom shower really could benefit from this! We have dreadful textured white walls throughout the entire house. They are so hard to keep clean, this would be great to get into all the little pockets and grooves. I would use this on my baseboards around my home. I would use it in our bathroom. In our bathrooms and on all the rails and baseboards. I'd use it in the bathroom! This would be great for the bathroom! this would be great throughout my house, with three teenage boys. This would be great for the kitchen(and everywhere else in the house)!! I would use it in the bathroom - it's all tile and the grout could use some help! Everywhere! We a toddler and another on the way - and we just moved into a new home, I can only imagine the messes they will make. It'd also be great for the bathrooms. The whole house in every room! I would use this in my kitchen and bath. It would also be great for cleaning dog crates and litter boxes - much safer than using harsh chemicals. I have pets and kids so i would be using this on my carpet and furniture. Thank you for the opportunity! I have 3 sons. I could definitely use one! I could use this fr the RV after trips to the mountains. My bathroom, Garage, And car. I would use it everywhere. Especially my deck and to take the wallpaper off my kitchen walls. I would use it in the living room and bedrooms. I could use this in my bathroom and my dining room. I THINK i COULD USE IT IN EVERYROOM! The most important room is the bathroom! I would love to use this on my sofa!! Everywhere...but mainly the heavy drapes that have to be professionally cleaned. UGH! all the floors in my home.... need a cleaning badly! I could use it in our guest bedroom. I would use it on my wood floors! I'd use this in our bathroom. Thanks for the giveaway…bathroom grout !